Warning today’s post is about Chicago Bears football. It’s my blog I’ll write about whatever I want. 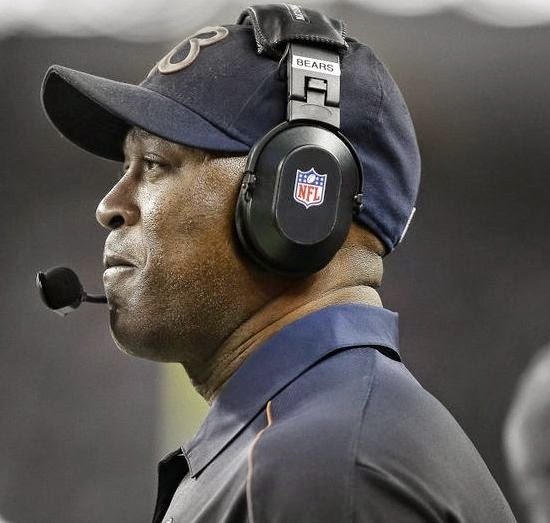 Today, Sunday November the 23rd, Lovie Smith will return to Soldier Field in Chicago where he coached for nine seasons. With his return I’ve noticed some mythologizing going on. There seems to be a general trend of turning what Lovie was, a good and solid coach, into a great coach. People seem to forgot how strong the calls for his firing were back in 2010 and how much general criticism he received. So I am going to list off what I consider the top ten mistakes Lovie made, from least to greatest. I put this at number ten because this may have mostly been a Jerry Angelo call. Thomas Jones’ successful running was taking precious playing time away from fourth overall pick Cedrick “Bust” Benson. As his nickname implies, Cedrick “Bust” Benson was a complete bust with the Chicago Bears. He went on to have a minor blip of success for the Bengals, but has been out of the league for years. This one might just be a personal issue with me. I’ve never liked Ron Turner being hired. He seems to be a classic example of someone elevated just above their competency level. I didn’t like when I ran the Bears offense the first time, I didn’t like him being the head coach of the Fighting Illini and I didn’t like him during his return stint with the Bears. He was the most successful offensive coordinator Lovie had but that aint saying much. Devon Hester had an electric start to his career on his way to becoming the most prolific returner in NFL history. Wanting to maximize on Devon’s abilities Lovie moved him from returner only to wide receiver. The goal was to have him get is hands on the ball a lot more. It never did really pan out. Devon was a mediocre wide receiver and his return ability suffered. What success he had came on bubble screens. He seemed incapable of accurately running routes. I am a bears fan, this means I’ve seen a lot of bad quarterbacks in my time. Henry Burris, Rick Mirer and several others have bumbled their way around the Soldier Field turf. But the worst I’ve ever seen was Jonathan Quinn. New Offensive Coordinator Terry Shea was bringing an exciting and different offense to Chicago. He demanded a competent backup who knew the system in case Grossman got hurt… again. Shea sold everybody on Jonathan Quinn, a fourth year player that had rarely seen the field. It quickly became obvious why he hadn’t been playing. Quinn didn’t seem to know the basic rules of football. He didn’t seem to have clue what plays were called. He would fall back look around confused as if he had never seen a football field before and then get sacked by large men. Awash with new power, and some might say hubris, after taking the Bears to the Super Bowl, Lovie decided to flex his muscle. Rivera was given many accolades for the Bears effective defense. He was so highly regarded that he interviewed for several head coaching jobs. Whether Lovie felt threatened by Rivera or he really just wanted to take control of the defense himself, Lovie hired his yes man friend Bob Babbich as defensive coordinator. All the time telling people to “trust me”. To secure the success of his friend, Lovie signed safety Adam Archuleta to a three year contract. Archuleta had been a very good player in his prime, but most NFL observers said he was past it and had lost a step, or two, or three. Lovie, ever loyal to his friends, rewarded Archuleta. Archuleta was horrible and ended up being benched not long into the season. At the end of the 2009 campaign after three seasons of missing the playoffs, the calls for Lovie to be fired where thunderous. Many fans thought it was a sure thing. Somehow Lovie convinced the Bears to keep him but fire the entire offensive coaching staff. So Lovie was looking for his third O coordinator and also a defensive coordinator since we would no longer be allowed to call his own defensive plays. Lovie targeted some big names to be the new coordinators. There was one problem though. Everybody knew Lovie was on the hottest of hot seats and it was playoffs or unemployment in the coming year. Who would want to take a job with a high chance of losing it in only one year. That doesn’t look good on your resume. So after over a month, Lovie finally called up his old buddy Mike Martz and offered him the job. Lovie initially rebuffed Martz and wanted to look elsewhere. Best of all, after specifically saying that d-line coach Rod Marinelli would not be considered for the d coordinator position, Lovie hired Marinelli because no one else would take the job. Beginning to sense a theme? After the 2011 season Mike Martz was forced to resign because of “philosophical differences” with Lovie. The “differences” being that once again Lovie was in the desperately trying to save my job mode. A new sheriff, general manager, was in town and Lovie could hear the gallows being built. Once again Lovie was faced with the problem of trying to find a qualified candidate with the sword of unemployment hanging over every bodies head. This time Lovie didn’t bother with the embarrassing month long search and named Mike Tice, who was the offensive line coach, as the new O coordinator. Tice was horrid and Lovie was fired a year later. Lovie was known in Chicago for having a tense and acrimonious relationship with the media. He provided little access except for the required press conferences and those were usually filled with terse responses. You could sense the contempt for the media members in his face and body language. I get it. The Chicago sports media can be very tough and I find most of them unlikable. But your relationship with the media is your relationship to the fans. I have heard that member of the bears organization encouraged and explained to Lovie that he needed to be amicable to the media to win the fans. My guess is Lovie didn’t care. As long as he had the locker room, it didn’t bother him what the fans thought of him. He came off as arrogant rude and condescending. Fans had trouble understanding how much the locker room loved him. Even during success, fans tended to have a overall negative opinion of Lovie. For his first year as coach Lovie wanted to have a dynamic offensive attack like the one that led the Rams to win the superb owl. He tried to get his friend Mike Martz, but that marriage made in hades would have to wait for several years. Unable to hire Martz, Lovie moved on to hire quarterback guru, offensive genius, and moron Terry Shea. Terry Shea made the previous offense under John Shoop look high powered. Shea was horrible at every aspect of the game. He even manage to mess up public relations when he absurdly gave himself B. It was not just that the Bears had the 32nd ranked offense that year, it was 32nd by a large margin. They had over 500 yards of offense less for the season than the 31st ranked team. The Bears fired Shea after his one terrible season. Lovie never did figure out the offense in his time in Chicago. The one season they managed to have a the 15th ranked offense they went to the Super Bowl. If he could have just maintained an average offense, he would have had much greater success. As I said at the beginning, I do believe that Lovie was largely a solid and good coach who got the most out of many of his players. I think most of the failures under his regime should really be placed at the feet of general manager Jerry Angelo. If I wanted to do Angelo’s greatest mistakes there would be more than ten.